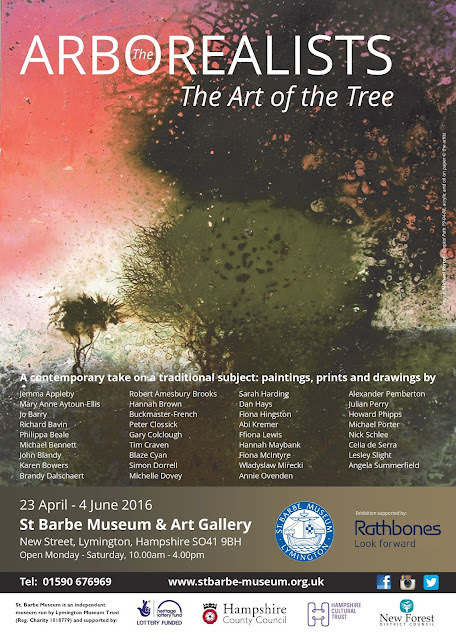 The Arborealists, a major new exhibition at St Barbe Museum & Art Gallery, Lymington will showcase works by 35 contemporary artists on the common theme of trees. Although united in their subject, they use an incredibly varied set of working practices. The exhibition opens on Saturday 23rd April and runs until Saturday, 3rd June 2016. In 2013, St Barbe Museum & Art Gallery mounted a successful two-part exhibition Under the Greenwood – Picturing the British Tree; the second exhibition featured contemporary artists’ responses to the subject. Such was the impact of this show, and the spirit of camaraderie engendered in a truly diverse group of artists, that they took on a more permanent identity as the Arborealists. The artists have joined together for exhibitions in galleries across the south and are now coming to St Barbe Museum and Art Gallery in April. Their artworks are at turns dramatic and contemplative, demonstrating that trees still have relevance in contemporary art and retain the power to move us all as a vital element in our landscape and sense of national identity. Those exhibiting include Jemma Appleby, Mary Anne Aytoun-Ellis, Jo Barry, Guillaume Brandy and Francis Dalschaert, Tim Craven, Michelle Dovey, Dan Hays, Ffiona Lewis, Fiona McIntyre, Wladyslaw Mirecki, Michael Porter, Howard Phipps and Celia de Serra.